Spy voice recorders are the best device to secretly record conversations of people that you don’t want to know you are doing so. You can keep one in your pocket and when the right time comes, simply push that button and smile to yourself, while the person you're secretly recording spills the beans. 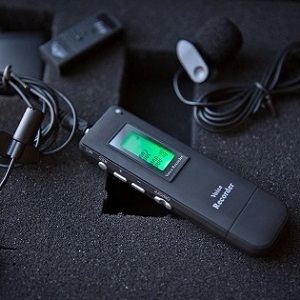 A spy audio recorder can be concealed on your person, or in a room location, and are used by undercover law enforcement, private investigators, and lawyers, for capturing crucial evidence. + Covert design - unless it's one to keep in your pocket, your covert voice recorder should be completely inconspicuous, (no flashing lights, etc). + Voice activated - ideally it will have the ability to be voice activated as well as continuous record. + Good quality audio playback - should be clear audible playback with no crackling or distorted sounds. + Good recording range - the audio device can easily record conversations close-up and at a relatively long range (at least wall-to-wall in a standard room). + Easy function - unless it's a voice activated spy recorder you may want an easy one-touch voice recorder you can simply operate without looking. + Long Recording Time - depending on use, you will want a decent amount of storage space. Audio doesn't take up as much space as video but your spy voice recorder needs the capability of storing long recordings. + Audio transfer ability - the audio files can be transferred to computer or SD card. The RaWerks law enforcement voice recorder received a 5.0 out of 5 stars. High Definition audio up to 28 feet away. Records up to 72 hours. Simple on-off control, adjustable sensitivity control. Time Stamp. As this spy recorder comes with magnets, we would primarily look at using this feature by placing it onto or under metal surfaces such as metal office cabinets, vehicles, etc. but it can be used in other ways. Covert: This law grade spy voice recorder isn't exactly the most covert designed recorders to be used in the open as with a pen, or other everyday item. Its design was built with magnets and to be strategically placed - hidden away from the eye - on or under a metal surface. It can also be hidden in a pot, jar or cupboard and simply placed in your pocket to be used as a body-worn device. Voice activated: yes, this professional spy voice recorder has a voice activation mode which can be adjusted for sensitivity - perfect for unnecessary recording. Playback quality: the RaWerks law grade recorder produces a high quality audio playback with great end results to listen to, so you can be sure of what was said. The voice recordings need to be transferred to computer for listening to and has date and time for easier file identification. Recording range: a great feature this audio spy has is the high quality voice recording from up to 28 feet away. This means you can capture conversations at longer distances, particularly in large rooms. Easy function: the one button control makes it easy to activate when using in close proximity to your target. Just discreetly tap the on/off button on top to start/stop audio recording. There's no sound or lights to give you away. Recording time: this spy voice recorder has 8GB of internal storage and is able to record up to 288 hours of high quality audio. The battery in standby mode will last 75 days and will record 72 hours of audio before needing to be recharged. Audio file transfer: transferring the recorded audio files of this covert recorder is easy with its USB file transfer feature. There is no special software needed for audio download and storage and works with both PC and Mac computers. The EyeSpy flash drive recorder received a 4.5 out of 5 stars. Good quality high definition audio. 15 hours on a single battery charge. Easy 3-in-1 control switch, 4GB storage, holds 144 hours of audio. We would use the flash drive spy recorder for the office. It can also be used as a room bug placing in on a shelf out of the way. Covert: it looks outdated and kind of boring, which is perfect for secretly recording conversations. It attracts very little attention and would actually be a great covert voice recorded, even in the open. Being small, you can place it anywhere and is a great spy voice recorder for the home or office. Voice activated: yes, as well as having a continuous record function this is a professional voice activated digital spy recorder. Place the recording device where you want and forget about it. It'll turn itself on the next time it hears sound. Playback quality: the flash drive spy has high quality audio recording, giving a crisp clear playback. The files are recorded in High Definition and can be played back in any audio program including Windows Media Player and iTunes. Recording range: it has a moderate recording range and can pick up voices from as far as about 20 feet away. So is ideal for a room or car bug. Easy function: this spy voice recorder has no confusing buttons or lights just an easy one-touch button. It has a rotating button / switch - push the button / switch to start and stop recording, and rotate it up or down to easily switch between voice activation and continuous recording modes. Recoding time: it has an in-built battery and 4GB storage capacity that can hold up to 144 hours of audio recordings, and can record for 15 hours in continuous mode on a single battery charge. It can also record while plugged into a computer or wall using a USB wall charger, so you don't have to worry about battery power. Just plug it in and record until the memory is full. Audio file transfer: you can connect the flash drive audio spy to any PC or MAC computer via a USB port to easily listen to the recorded files. The SpyCentre keychain recorder received a 4.5 out of 5 stars. 10 hours on single battery charge. Easy on/off, 2GB flash memory, holds 30 hours of audio. We would use this spy recorder during meetings. You could place it on a table at work or in a restaurant in plain view while it records your conversation. Covert: We love this spy recorder's covert ability. It looks like a regular car remote control keychain that's "nothing special". This is precisely what you want in a stealthy audio recording device; something you can place in your pocket or on a table and goes totally unnoticed. You can simply activate the device (completely undetected) and it just looks like you're fidgeting with your keys. Voice activated: yes; you can change the mode from continuous to noise activation recording. Playback quality: the playback quality is good, so you can be assured of getting clarity audio. Recording range: the keychain voice recorder has an audio pick-up range of 40ft in optimal conditions which is fine for recording at close range or in large rooms. Easy function: this micro spy voice recorder couldn't be any simpler to operate. It has a simple on/off switch for quick action recording. Recoding time: the 2GB flash memory holds up to 30 hours of audio; which is plenty of room for all of your secret audio recordings. On a single battery charge it has the ability to record continuously for 10 hours or 50 hours in voice activation mode (although it can only hold un to 30hrs of audio). Audio file transfer: this audio recorder is compatible with MAC or Windows and no other software is needed to transfer files using its USB Device. Just plug it directly into a USB port and transfer your audio files. The USB is also used for charging the device's in-built battery. The best reason for using a covert voice recorder is that it gives you control and leverage - but don't use one for illegal or unethical purposes. 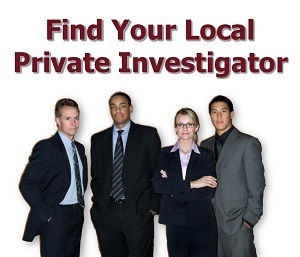 It should be used to help you or another in legitimate situations - particularly in gathering and building evidence. + You're being harassed or intimidated at work and you want to record the evidence without the bully knowing; so you can take action against them. + You’re a private investigator on surveillance needing to record real-time events where use of a notebook would attract too much suspicion. Or you want to secretly record someone's conversation, as it relates to your case. + Perhaps you've noticed some signs of infidelity and suspect your partner is cheating on you, and you want to covertly record conversations or what occurs in your home. Or you want to listen to how your nanny treats your children. + Maybe you're a lawyer wanting to record your interviews without making the person being interviewed feel uncomfortable - knowing if the interviewee was aware of the recording could cause inhibited communication. Whatever the reason, you will want to make sure you buy the best audio recorder you can. You will want to make sure you get the right specifications in your device.